« *** WINNERS *** Jennifer, Gerrie and Martha are Living the Life of Riley! CONGRATULATIONS! I love being a homeowner, for now I have a permanent palette to create and decorate as I please. We've lived in our home for over five years and have changed almost every inch of it to suit our style and tastes. Currently, we are in the process of remodeling our kitchen and due to the oh-so-stylish gold lacquered fixtures already installed there, I was ready for a much-needed update. When thinking of changing our kitchen faucet, several manufacturers came to mind, including Pfister. For over 100 years, Pfister has been one of the leading manufacturers of quality faucets. They were kind enough to allow me to review one of their newest kitchen faucet designs, the Elevate EXT, which just happens to be the world's only adjustable height kitchen faucet. Keep reading to find out more. 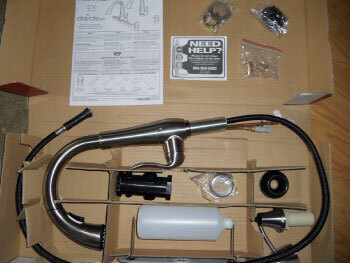 I reviewed the Elevate EXT Kitchen Faucet from Pfister, which retails for $198.00. There were so many features that immediately drew me to the Pfister Elevate EXT kitchen faucet. First, I love how this faucet looks sleek and traditional at the same time. Our kitchen will eventually be transformed into an old-world inspired Tuscan villa and the curves and styling of the Elevate EXT compliment the look we are going for perfectly. I am also thrilled at how Pfister stands behind their faucets with a lifetime guarantee on both their finish and function. How great is that? 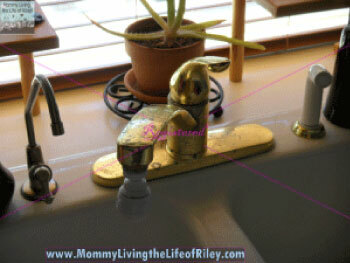 Take a look at my current kitchen faucet, shown below. The finish now looks horrendous (though I doubt the gold lacquer ever looked that good to begin with). I know that this kitchen faucet is approximately 15 years old, but it has looked like this since we first moved in over five years ago. Pfister actually stands behind both the faucets they sell as well as the appearance of the finish...for life! It's extremely reassuring to know that I will never have to worry about my kitchen faucet being in this sad state again. I also loved the Stainless Steel finish, which is designed to resist abrasions and discolorations even better than traditional brass or chrome. I am also very excited that the Elevate EXT has a high arc spout, which will make cleaning large pots and pans or filling up pitchers of water, so simple and easy! The spout on my current kitchen faucet simply sticks straight out and always seems to get in the way, but the Elevate EXT spout is actually 11" high. Cleaning anything large and cumbersome, like the roasting pan I use for cooking our Thanksgiving turkey, is nearly impossible with the current faucet I have and results in a ton of unnecessary banging and clanging (and cursing). Of course, that's what makes the Elevate EXT so unique...the spout's height is also adjustable! There are 3 adjustable heights, ranging from 8" to 11", which can be achieved with the touch of a button. Now, you can raise the kitchen spout up when you are cleaning large, bulky items, but then lower it back down again to reduce excessive splashing of water when washing smaller items. I can't get over how completely versatile the Elevate EXT is. 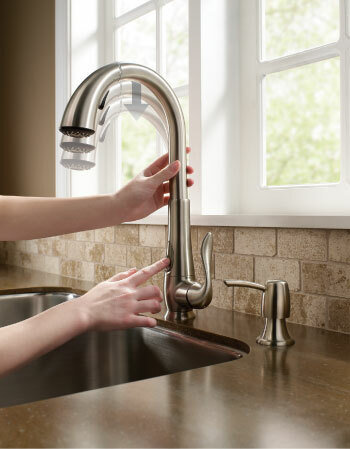 There's absolutely no job too big or too small for this kitchen faucet! But wait...there's more! The customization doesn't stop there, because the folks at Pfister also designed the head of this faucet to double as a pull-out sprayer. The Elevate EXT features an ergonomic dual function spray head with spray and stream modes, and an extra-long 70 inch pull-out hose that doesn’t leave a spot of the sink untouched. Not only can you wash those extra tall pots and pans with ease, you can even use the pull-out sprayer to get in close and really clean that baked on gunk away! 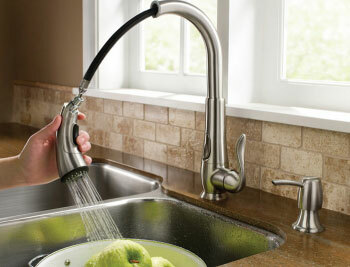 The spout of this kitchen faucet even swivels a full 360-degrees too. Finally, the Elevate EXT from Pfister also comes complete with a separate soap dispenser. Now, this is a novel idea and I'm so excited that I no longer have to scour every home decor store trying to find a soap dispenser which matches both my sink and my kitchen's decor. The matching soap dispenser gives the sink area an entirely integrated look and filling the dispenser itself couldn't be easier either. Simply unscrew the large plastic bottle under the sink, fill with your favorite type of hand or dish soap and replace. Now, because we haven't installed our stainless steel sink yet, I wasn't able to actually install the Elevate EXT in my own kitchen. But, I've installed many different faucets in our home over the years and thoroughly inspected the Pfister Elevate EXT, keeping my previous faucet experience in mind. As soon as I opened the box, I noticed two things. First, Pfister packaged this faucet very well and I received a product free from any damage. Second, the instructions they provided were very clear and concise, with a detailed diagram showing every step of the installation. Because I've got plenty of do-it-yourself experience from installing previous faucets, I can tell you that the Pfister Elevate EXT is a high-quality faucet in every sense of the word and one that seems to be a very easy install. I can't wait to get this well-designed faucet up and running in my own kitchen, for I know that it will provide the beauty, elegance, function and style that this room has been needing for so long! Since it is also made by Pfister and backed by their lifetime guarantee, I'm sure that it will continue to perform and look gorgeous through the years! Disclosure: I received the Elevate EXT Kitchen Faucet from Pfister in order to facilitate my review. No other compensation was received. This product review is based on my own personal experiences with this item and is completely honest and objective.